Media companies are experimenting with new business models all over the web. But this month, The London Times learned that even just asking for registration details can pretty steeply shrink audience numbers. According to Hitwise, The Times’ registration page — for the paper’s free content — dropped its market share by half. For publishers looking for more than just an email address from readers, there is reason to be wary. Any publisher looking to charge for content in the near future is aware that revenue will come at the expense of readership. But the Times isn’t charging its readers yet. It just asks for their email. After June that will change. But there is reason to be concerned about the paper’s future prospects online. Traffic to The Times’ website, which remained pretty flat during April and May, tanked in June. The paper’s market share has dropped from 4.37% during the week ending May 22nd to 2.67% in the week ending June 19th. On June 23, the paper’s market share was down to 1.81%, less than half of the website’s average in May. But it’s hard a hard sell to advertisers to explain that an audience is improving while dwindling away. That said, paying customers are highly valued by newspapers and magazines, and if The Times can get respectable numbers signing up next month, advertisers might not be too distraught. Hitwise found that the average session times at The Times fell from five and a half minutes to three and a half minutes, which is significant, but considering that the people who did not register likely dwelled for a small amount of time, there’s reason to think that registrations are going strong and those readers have spent a good amount of time exploring the site. Those dwell rates are certainly better than the numbers released by Wiggin, a media law firm which predicted The Times could lose 90% of its readers when it launches its paywall. And for The Times’ competitors there is definitely good news in the short term. 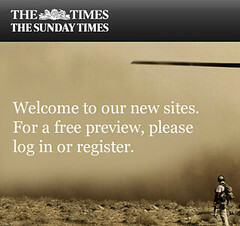 The Telegraph, Guardian, Independent, Daily Mail and BBC New were all beneficiaries of the Times’ registration page. The numbers aren’t staggering, but if readers think they can get similar content with less hassle, they may not go back to the Times site. Of course some visitor drop off is expected whenever a website puts a barrier between customers and content. But it’s interesting that the Times went for registering before charging. This week when people have to start paying, the line between customer and casual visitor will become even more pronounced.